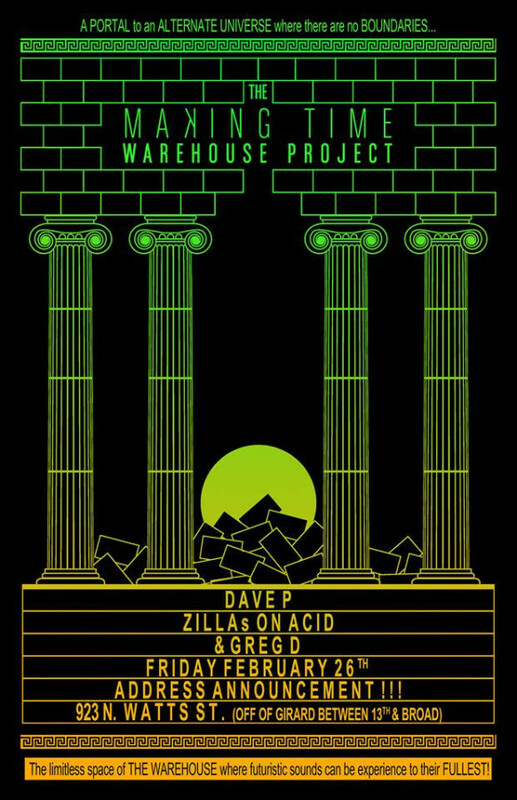 The Making Time Warehouse Project – This Friday 2/26 – @ 923 N. Watts St. (Watts is off of Girard bet. 13th and Broad Streets) !!! Beyond this doorway lies a PORTAL, a GATEWAY to a LIMITLESS space, an ALTERNATE UNIVERSE where futuristic sounds are truly experienced to their fullest, where we are completely FREE to immerse ourselves fully…..BODY, MIND and SPIRIT in the sounds of THE FUTURE and as a result, obtain maximal TRANSCENDENCE & TRANSFORMATION . This ALTERNATE UNIVERSE is…..THE WAREHOUSE and in THE WAREHOUSE we will share a LIMITLESS futuristic musical party experience WITHOUT BOUNDRIES at The Making Time Warehouse Project on Friday February 26th on 923 N. Watts St. (Watts is off of Girard bet. 13th and Broad Streets) !!! Let’s party OUT OF BOUNDS, Philadelphia . @ 923 N. Watts St. (Watts is off of Girard bet. 13th and Broad Streets) !!! This entry was posted in Event and tagged broadzilla, davep, davepandsammysliceunited, futuristicsounds, making time warehouse project, makingtime, makingtimeisrad by admin. Bookmark the permalink.